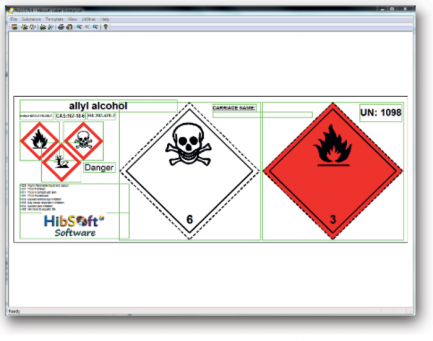 Chemical Labelling Software – Created by Hibiscus Plc. Label Enterprise software is a quick and simple solution for producing high-quality hazard warning labels for chemicals and hazardous goods. Enterprise is designed to work with any standard Windows compatible printer to easily produce carriage, supply, janitorial and combination labels to CLP and ADR standards, as well as a wide range of other label and document types. Label Enterprise can also produce labels in multiple languages, to identify your products and provide the end user with appropriate hazard, risk and safety information; and Combination Labels, combining all relevant Carriage/Supply details including warning diamonds, GHS symbols, Hazard & Precautionary phrases etc. Enterprise allows you to merge the same substance information with any number of different template styles to satisfy all of your labelling needs – from lab samples to bottles, drums and IBC’s. You can even save these combinations to quickly reproduce those labels at a later date. 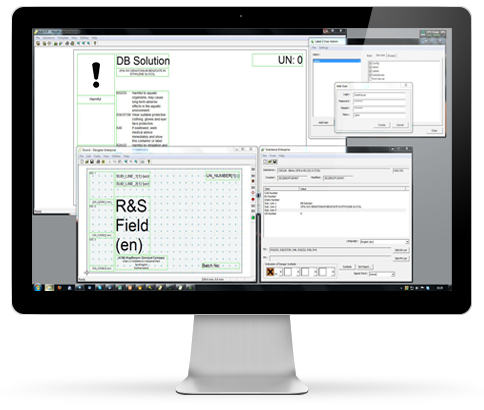 Unlike some other chemical labelling software systems, HibSoft Label Enterprise has no output or usage restrictions and is designed to work with any standard Windows compatible, printer. Enterprise is quick and easy to use and the WYSIWIG – What You See Is What You Get style interface allows you to preview the appearance of your labels on screen before you commit to print. Enterprise can produce hazard labels from its own internal database of chemical information (which includes the full list of CLP phrases in all EU languages), or by importing information from a compatible Safety Data Sheet system. Importing labelling information from your SDS’s eliminates the need to maintain two databases with the same information and a real-time link ensures that your labels are always perfectly synchronised with your Safety Data Sheets. With our Print Runner add-on, Enterprise can even produce labels automatically to requirements received from your SAP or other ordering system. Enterprise is supplied with a selection of ready-made standardised label templates appropriate to standard carriage and supply legislation requirements. Additionally, we can prepare and supply template designs customised to your own specific requirements. Alternatively, by purchasing the optional designer module, you can design and create your own unlimited range of templates giving you absolute control over your label designs. Enterprise also allows you to store combinations of Substances and Templates as predefined labels for rapid lookup and printing. Furthermore, because these combinations are stored as references rather than as a snapshot, if either the substance data or template design changes, all the relevant stored labels will change with it. True client/server technology for easy and reliable network sharing over LAN or WAN. A choice of data sources to read labelling information from Label Enterprise’s own built-in database and/or directly from your SDS software. A customisable database allowing you to add your own fields to the database to cover all your data retention requirements. Modular ‘open portal’ construction, making it easier to develop bespoke links to other software systems.